After Phil’s Companies Accompanied article was published, we opened the floor to the community to see what sort of varied, ‘zany’, historical lists they could come up with. The idea was to see what sort of historical forces could be represented by players around the world mixing and matching across books and formations, and boy were we impressed! Here’s a selection of five lists we thought were well worth sharing, especially the winning entry by Matt Conacher, which represents a hypothetical battle on the Island of Malta in 1942. Phil Yates' article on fielding forces across books piqued my interest, especially the challenge to create an unusual historical list. I have always been fascinated by "what ifs" and I'm sure that I share that with many other historical gamers. One "what if" that has got me thinking is the planned invasion of Malta in mid-1942. Mostly because of the motley collection of forces, in particular armoured, earmarked for the operation on both sides. The Italians had a mixture of troops including the Folgore airborne division, Marines, Blackshirts, together with some Semovente self-propelled guns and tankettes. The Germans had a mixture of some captured KV and T-34 Russian tanks, together with the experimental heavily armoured light tanks, like the Panzer IF mid-war monster. The British (and Maltese) defenders had large numbers of anti-aircraft guns and coastal artillery of various sizes, but only a small number of mobile artillery and even fewer tanks. But the Malta Tanks "squadron" was a mixture of early-war light tanks, cruisers and matildas, which I really like the idea of. In reality of course, this collection of forces never fought each other. But it's a fun little diversion to wonder if we can make two opposing armies for mid-war Flames of War scenario. I'm imagining a scenario based around a key airfield in Malta. The Italian airborne troops have landed and attempted to assault the landing strip, but have so far failed to push the defenders back. The Italian and German reinforcements, with armoured support, are pushing up from the beaches to link up and secure their objectives. Meanwhile, the British are sending in their only tanks to bolster the airfields defences and attempt to halt the advancing invasion. Firstly, I'd like to represent the Folgore airborne division which should definitely be elite. The Avanti book doesn't quite give me what I would like, but, with a bit of imagination, a German company could fit the bill. A Grenadier Company from Iron Cross, together with the Waffen SS Command Card gives us some fearless veteran troops. Their equipment is mostly comparable, with submachine guns, machine guns and mortars and optional anti-tank grenades. The 2.8 anti-tank rifle is close enough to the 47/32, without the HE shells for attacking infantry - but let's just pretend they have already been used up in previous attacks or the chaos of an airborne landing. Secondly, I want to represent the collection of armoured vehicles landing on the beaches. 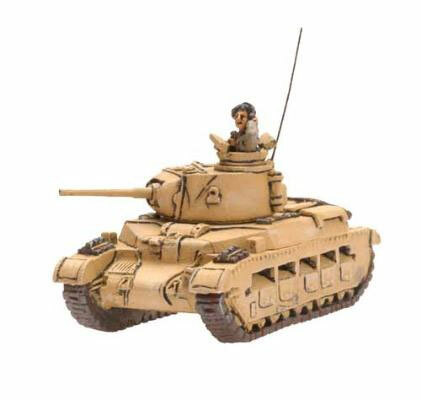 The Panzer I F from mid-war monsters (and the similar Panzer II J) would fit, but I can't find a neat alternative in the current lists. Instead I'll go for a looted T-34 and looted KV-1 from the Iron Cross command cards together with a Semovente 75/18 battery from Avanti. Both grenadier platoons have panzer-knackers to represent Pazzaglia bombs and the Waffen-SS command card to make them fearless. One looted KV-1 and one looted T-34 from the command cards.I think that could count as a German or Italian force! For the British, I really want plenty of tanks to have variety! Alongside those can be a rifle company with some AA support to represent the defenders. I can't seem to fit in any Americans into this (they have the wrong weapons mostly) so this is all from Armoured Fist. Not really in the spirit of Phil's original article, but I can't stop myself! The Matilda troop can come from the online article, but what about light and cruiser tanks? The closest thing to the Light Tank mark VI in Armoured Fist is probably the Humber armoured car. Given one or two of the 3 light tanks on Malta had 15mm guns, that is close enough for me. I'm happy to pretend that their veteran skill rating and scouting abilities represents their familiarity with the island rather than combat experience! The early-war cruisers were much lighter armoured than the mid-war ones. Possibly closer to the Daimler armoured cars, but I can't quite bring myself to include them or a dingo. Instead I'll go for the crusaders to represent A13 cruisers and honeys to represent A9 cruisers. They must be blessed with divine luck to make them harder to kill! The Australian divisional cavalry command card has all of those in, and some universal carriers, which can represent a relief force coming to the airfield so I'll use that. Now I'd like plenty of infantry to represent the defenders, so a large rifle company with support and AA weapons can do that. Some of the infantry were from the King's Own Malta Regiment, so perhaps I'll give them a little boost to represent them fighting for their homes (despite the fact they were on measly rations). Apparently, there were even some captured Italian guns from earlier in the North African campaign, but no command cards for that sadly! Formation Support is a 6-gun Bofors Light AA troop, a Humber Armoured Car troop to represent the light tank, and a Matilda Armoured Troop (to actually represent some Matildas!). 29pts. Stick in the Lucky command card to round up the points! That's it from me, sorry it ended up being so long! This is the best use of available assets to cover an unusual historical force - Phil. 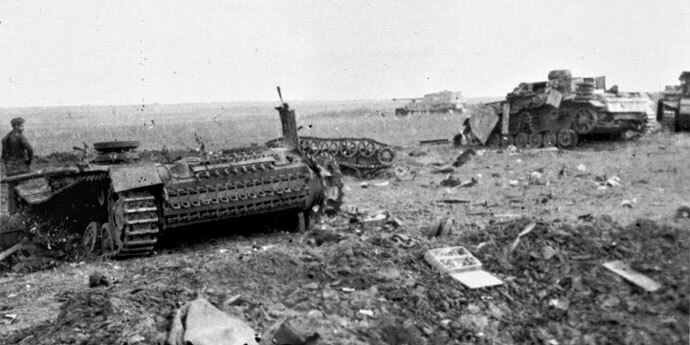 My list is based on a 1943 photo taken north of Kursk that shows two destroyed RC Panzer III, overturned Borgward demolition carrier and a Ferdinand at the distance: some of the rarest WW2 vehicles in a fight together. At last, RC company card from Ghost Panzers allows me to recreate it in a 109 pt list. This list is not without a punch: The Panzer III and Stuka flight scare off light to medium tanks, Ferdinand counters heavies, while Borgwards deal with gun emplacements and infantry. "Early on 26 November, Colonel von Broich sent a small force consisting of a company of the 11th Parachute Engineer Battalion, a company of the 3d Tunis Field Battalion, and a company of the 190th PanzerBattalion from Mateur toward Tebourba. The German force drew near Chouïgui pass after Colonel Waters' battalion had taken up its positions there for the day. Company C barred the southeastern entrance while the other three companies were on high ground, Company B parallel to the road approaching the northwestern entrance from the north and the others along the road from Sidi Nsir, extending as far west as St. Joseph's Farm near the Tine river. The enemy force, approaching from the north, included six Mark IV tanks with long 75-mm. high-velocity guns, a type not known to the Americans, and three or more Mark III's with 50-mm. rifles.The impending action was the first battle between American and German armor in World War II. The Germans continued southward past Major Tuck's company, concealed in hull defilade on the reverse slope of a ridge, to meet the challenge of Major Siglin's company. The latter maneuvered to strike the enemy from the southwest, after a bold preliminary skirmish by the assault gun platoon. While Siglin's men claimed the enemy's attention, Tuck's 37-mm. guns, firing at close range from the east flank and rear, knocked out the six Mark IV's and one of the Mark III's before the enemy pulled back to the same walled farm he had occupied the previous day. The fight cost the Americans six M3's and several casualties, including the life of Major Siglin. Truck-borne infantry elements of the enemy force, arriving later near the walled farm, were driven off or destroyed, and eventually the strongpoint itself was abandoned. Two squadrons of 17/21 Lancers and some British artillery attempted to cut off the enemy's retreat and shared in smashing at least one more of his Mark III's. One company of the 1st British Parachute Battalion occupied"
George F Howe, US Army in WWII, Chapter XVI ‘The Attack Toward Tunis’. To represent this with a 100 point list I have a US Stuart Formation supported by a British Death or Glory Formation with British Rifles pretending to be Paras. The artillery should really be British to do this you would need to make the British Death or Glory Formation the lead force supported by the Stuarts. You will also need to find 4 points (2 less Stuarts) to fit the points. The Cabinet Office appears to have different emphasis on the roles of the 17/21st lancers and the 1st Armoured Regiment. This Force is meant to represent a pioneer/engineer blocking element. It would be defensive in nature and is built from a standard that I used in Mid-War tournaments. The goal of this list was to build a force that has multiple nations, formation, and command cards. The army is based from the Afrika Korps book with an Allied Support from Avanti and a Formation Support from Iron Cross. I believe this list uses almost every kind of command card and is rather simple to understand. The core formation is a German 90th Light Rifle Formation from Africa Korps. 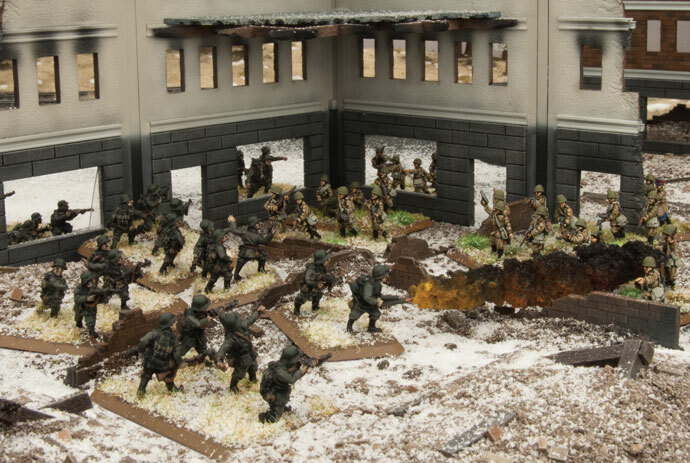 It is built with an HQ, two Rifle Platoons and a Tank-Hunter platoon which are all core units. 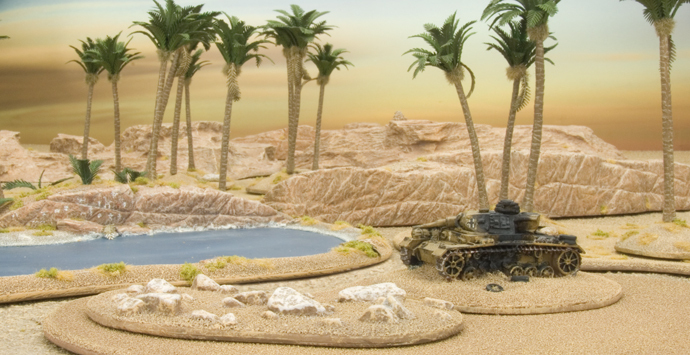 From the Afrika Korps support it has a Heavy Tank Platoon. A command card is used to create an Afrika Korps Armored Car Company. As Allied Support I used an Italian Bersaglieri Weapons Company as I am allowed up to one formation from an allied nation. Since my army is German, I took an Assault Pioneer Platoon as a support platoon (since it is a black box/core unit for a Grenadier Company). 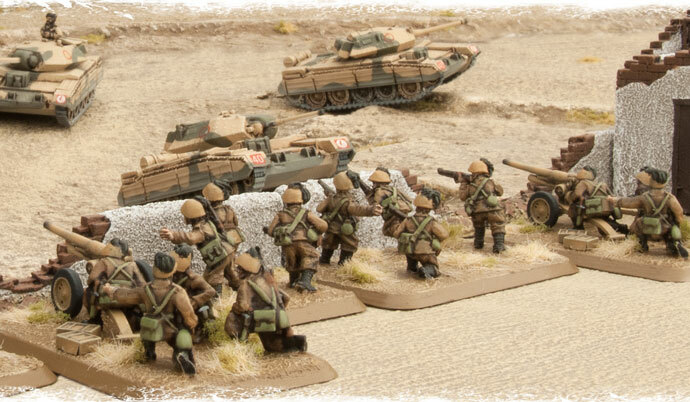 The “core” formations for this force are the 90th Light Rifle Company and the Armored Car Company. Lastly, for good measure, I've included the Captured Tank command card in this list as well so that these "buete-grenadiers" can add to their collection as well as panzerknacker to represent improvised explosives. 4x Captured T-34 (76mm)— 40 pts. Though this isn’t based on anything other than an idea, there were captured 25 pdrs on the Eastern Front with German units so it’s neat to see those represented - Wayne. This list has the most interesting diversity - Phil.